With spring just around the corner (March 20th), we wanted to help our residents at Le Montreaux Apartments get motivated to start spring cleaning. With help from MarthaStewart.com and HouseBeautiful.com we compiled a yearly ‘To-Do List’ before the weather gets hot again and everyone wants to spend time having fun in the sun! We know how much fun Austin can be! Start by cleaning out your closets. Ever just stuff some clothes in there to get them off the floor? Or is it overflowing with bulky sweaters and coats? Now is a good time to pack your winter clothes away and make room for a spring and summer wardrobe. Make sure to make a donation pile for the items you don’t really want, use, or need anymore. When in doubt, throw it out! If you don’t like to be inside cooking in the hot summer months, use your freezer. Prep meals that freeze well and that can be reheated quickly to speed up dinner. Grilling is also a quick way to serve up dinner on hot summer nights. Separate your cleaning supplies into buckets for where they are for such as bathroom, kitchen, laundry, etc. If you’re feeling extra motivated, create labels for each bucket. Now is also a good time to go through medicine cabinets and throw out old and expired products. You will be better able to determine what products you might need to stock up on and which ones to skip. A clean house is a happy house! Deep clean the entire house so that when you clean again it will be quick. 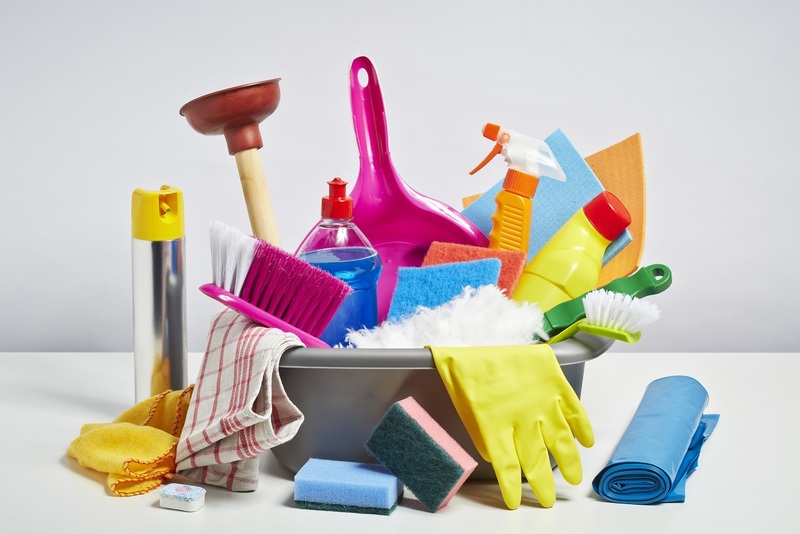 Here are a number of items that sometimes get overlooked when we clean house. The dishwasher. Use a specialty dishwasher cleaner to ensure the dishwasher is clean and can effectively clean your dishes. This should be done monthly. Entire countertop surfaces. Clean the entire surface and don’t forget to get the backsplash. Cabinets. Take the time to wipe off the tops and front sides of the cabinets where dust and grease can settle and build-up. The refrigerator. It’s a good idea to take all the shelves and drawers out and wash with soap and water and wipe down the interior of the fridge. The oven. At least once a year we should deep clean our ovens from top to bottom. Here’s an almost effortless way! Just warm up the oven to 150 degrees, turn the oven off, and then place a small bowl of ammonia (1/2 cup) on the top rack and a large pot with boiling water on the bottom rack. Let it sit overnight with the oven door closed and then wipe clean with some dishwashing liquid and a rag or sponge. Bedding. Pillows, comforters, dust ruffles. The washing machine. You can purchase a specialty cleaner or use white cleaning vinegar for the washer to ensure mold and mildew don’t build up and cause a stench you can’t get rid of. Leave the washer door open when not in use so it can dry out and further prevent mold and mildew. Windows. Clean the inside of each window but also make sure to clean the outside of the windows to remove dirt and grime that built up over winter. House Beautiful’s pro tip is to wash on a cloudy day, so the cleanser doesn’t immediately dry on the windows. Carpet. According to House Beautiful, the carpet should be professionally cleaned every 18 months in areas that don’t have a lot of traffic and three or four times a year in high traffic area. Complete Unfinished Projects. Finish up and projects you started over the winter to make time for the new ones come spring when the air is fresh, and the temperatures start to rise.